"Vegetable platters need not look all look the same. Here, fresh spring vegetables sit in an herb-laced hummus to resemble a spring garden in full bloom. My kids loved plucking the crisp vegetables from the garden, so much so that I think they forgot that they were filling themselves up with such a healthful snack." Blend chickpeas, tahini, water, lemon zest, lemon juice, basil, parsley, chives, mint, garlic, and salt in a blender until smooth. Spread hummus in a 2-inch deep baking dish. 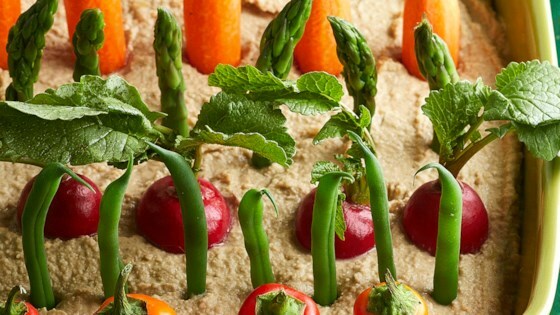 Arrange carrots, sugar snap peas, asparagus, radishes, and celery in neat rows in the hummus to resemble a garden. Feel free to use your favorite dip here just so long as it's thick enough to help the vegetables stand. It should be at least 1-inch thick in the pan to support the vegetables. Taste hummus after blending and add more salt or lemon juice, if you'd like. Use any variety of fresh herbs in place of the ones listed here. Use fresh vegetables of varying heights, textures and color. My favorites are slender carrots with a bit of their greens still attached, snap peas, radishes cut in half with their greens, asparagus tops (great raw or you can blanch if you'd like), celery (the interior stalks with the leaves are my favorite), and small peppers. Just adorable to take to a dinner party for munching before dinner. Love this! This snack was the highlight of my family gathering! It's easy to made, and fun to eat! I recommend this to all my friends.